Art Speaks often features a member organization or guild whose collection is housed in Textile Center’s library. The purpose of the St. Paul Needleworkers guild is to stimulate appreciation for and celebrate the heritage of embroidery by advancing the highest standards of excellence in its practice through education, exhibition, preservation, collection and research. The meet at Lutheran Church of Resurrection at 910 County Road D in Roseville, Minnesota every 1st Tuesday of the month at 10 am. Textile Center Library’s needlework collection is impressive with approximately 1,600 books and magazines. Several of them were donated by the St. Paul Needleworkers. The Royal School of Needlework in Great Britain was started in 1872. Lady Victoria Welby wanted to make sure that the arts and techniques of hand embroidery were kept alive. RSN is the primer organization today teaching hand embroidery in order to ensure the highest standards. It welcomes stitchers from all over the world to enroll in their classes. Ukraine’s many regions have unique styles, colors, designs, and stitching techniques, which evolved from the fact that each one has different native plants and ways of weaving the materials. Embroidery threads were homespun of hemp, linen or wool. White, black and red are the signature colors in all the embroidery designs. The work in this book has been researched and prepared with great concern for its historical, ethnographic, and technical accuracy, and includes photos of the work and charts for duplicating the examples. European and American samplers were the product of school instruction– which is why so many have been found and documented. It was important for the girls to learn alphabet stitches, as each girl would be able to mark the linens of her future household. This book presents the most important forms of American samplers and needlework picture now known, providing a reference point for comparison. The work is organized by town, county, or schools within the states. 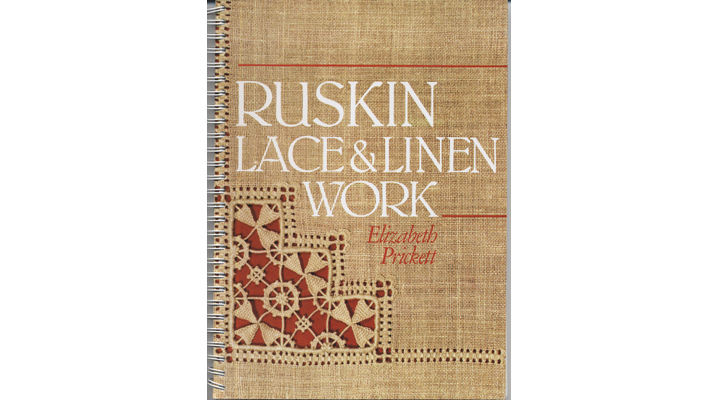 John Ruskin in 1894 wanted the people of Lake District of Brantwood, Coinston, England to have a way to earn a living by creating Ruskin Lace & Linen work. There were three forms of needlework: drawn thread, cut linen and needlepoint. This book begins with the history, then is organized into three parts:  detailing working diagrams and photographs showing the different techniques and order of working;  presenting copious illustrations and 60 patterns to show how these techniques are made into projects; and  showing advanced methods of using these techniques on other types of already made articles. This book provides the reader with mixed media techniques, such as, ribbon work, appliqué, fabric manipulation, beading, and stitching in order to bring the look of fruit, plants, animals, and insects into three dimensional life. Stitch diagrams and templates are provided, as well as beautiful colored image examples. Natalie Chanin grew up in Florence, Alabama. She has written three books that share the techniques she has refined to create her own line of handmade couture collections from recycled cotton jersey fabric. She talks about the rise and fall of the cotton industry, and why she is dedicated to using the traditional skills to create modern sustainable projects.